Google Earth 5 gives non-profits new tools! Google Earth 5 gives you the ability to create a guided tour using KML Touring. KML Touring allows you to tell your story by creating a movie-like tour in Google Earth. You can add enhanced navigation, balloon pops, image overlays, voiceovers, music and sound, and many other types of special enhancements. Get creative and bring your cause to life. 2. Click the record button ( ) to start recording actions. The button changes to red: After you have clicked this record button, the time counter begins counting, showing the duration of your current KML Tour. 3. Create your tour by performing your actions – flying, zooming, panning, and rotating the globe, making layers visible and hidden, and popping balloons, if desired. A 3D Space Navigator, like the one created by 3D Connexion (http://www.3dconnexion.com/), can be extremely helpful for navigating smoothly across the globe. 4. When you are finished performing your tour, stop recording by clicking the record button ( ) again. Your recording stops, and the Tour Player appears in the bottom-left corner of the 3D Viewer. The KML Tour that you just created automatically begins playing. 5. To save your KML Tour, click the Save to File button ( ) in the Tour Player and give your KML Tour a name. It is then stored in your Places panel. To save it to a permanent .kmz file, right-click the tour in your Places Panel, choose Save Place As… and save your .kmz file to a location on your computer. You can add to your KML Tour easily. 1. Start playing your previously-created tour by double-clicking on the tour you saved in the Places Panel, or select it and click the Play Tour button ( ) next to the Places Panel. 2. Click on the button in the toolbar to add a tour: The Add Tour tools appear. 3. Click the record button ( ) to start recording actions. After you have clicked this record button, the time counter begins counting, showing the duration of your new current KML Tour. You can also click on the microphone button ( ) to begin recording a tour with narration. A new tour is now being recorded, which started at the moment you hit the record button for this iteration. It will use the previously recorded tour as a backdrop, but your new movie is only the duration of the time counter on the new iteration! For this reason… it is recommended that you save every iteration as a new tour, until you are happy with the final product! 4. At any time, you can click the microphone button ( ) to record your sound (voice or music) at that time location at which you clicked the button. The sound recording is stored as an .mp3 file within the .kmz file, and will play at the time interval at which you recorded it. When adding an iteration to an existing tour, you can click and hold on a location on the globe (i.e. building, mountaintop, etc. ), and the camera will stay on that location, swiveling around it. When you un-click from that location, the previously recorded tour will continue as before. You can add several layers of sound to your tour. For example, record narration with your tour. Then, with the tour recording options showing in the lower-left corner of the screen, click on the record button again and play a music file. In this way, you can "stack" a sound file on top of an existing tour. Features, including placemarks, lines, polygons, and ground overlays, now have a time element associated with them. This comes in very handy when you're including historical imagery in your tour. When you add a placemark, you'll notice that it now has a time element to it. Click the "Add Placemark" button in your toolbar. Then click on the "View" tab. Notice that there's a new field for Date/Time information. An easy way to set up a tour is by putting all of the places you want to visit in a folder in your "Places" panel. If you're looking at a historical image to include in your tour, instead of moving the time slider while you're recording your tour, it's easier to save that historical image as a place to visit on your tour. To do this, while viewing the historical image, click on the "Add Placemark" button to add a placemark. In the Style/Color tab, change the opacity to 0%. In the View tab, click "Snapshot Current View" to set the time of the historical image for the placemark. Now, when you click on the placemark in your Places panel, as long as you have the historical imagery clock selected in your toolbar, you'll fly to the Date/Time of your historical image when you click on that placemark. 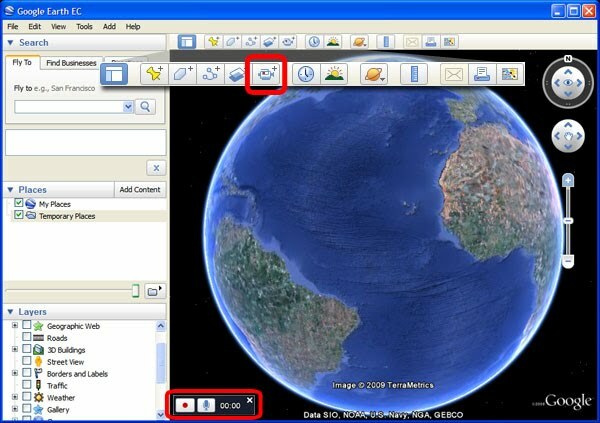 The gx in the element points to Google’s KML extension, which is needed for Google Earth and other programs to understand the additional KML. For this reason, all KML used for the touring must be preceded by gx:.